When a patient requests a more youthful appearance, I usually first asses their eyes. We’ve all heard that the eyes are a window to our soul, but they also are a dead give away for age. This is largely due to the thin skin that surrounds the eyes. In fact, skin on around our eyes is the thinnest in the body with little to no fat underneath it. Without very much natural support, wrinkles are more obvious, eye bags are more noticeable and the eye lids become heavy and hooded. 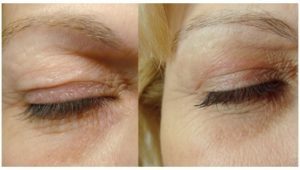 A combination of Botulinum Toxin injections along with hyaluronic acid replenishment can treat wrinkles and eye bags, but until recently a heavy eyelid could only be treated with surgery. Enter Plexr and the non-surgical blepharoplasty. The Plexr device uses an electrical arc to heat the skin. This causes a tightening of the uppermost layer of skin which in turns lifts the eyelid. It doesn’t involve any surgery, so their are no stitches, no need for any injectable or general anaesthetic. Plexr’s results are immediate, they can last for years and are comparable to a surgical eyelid lift. At Bodyvie our patients have a detailed consultation with a doctor to determine if Plexr is appropriate. We apply a local anaesthetic cream to the upper eyelids. The treatment takes on average 45 minutes. Immediately after the treated area is covered in small crusts which fall off in 7 – 10 days. These can also be camoflagued with mineral make-up. There can also be some mild swelling for the the first 2-3 days. I’ve seen some fantastic results with this technology, especially when used in combination with other anti-ageing treatments around the eyes. If you think your eyes could do with a boost, come in for a consultation.